circulation, increased muscle strength and power, better flexibility and range of motion, better core conditioning and stability, and faster recovery. The G-POWER is the next generation in whole body vibration machines. Its true linear motion platform differs from traditional whole body vibration machines in 2 key areas: 100 percent True Linear Vertical Motion and the Ability to start at a low frequency and increase to high frequencies. It has been proven that every person has his or her own muscle frequency and each human body is designed to absorb vertical vibrations better due to the effects of gravity. Many machines vibrate in three different directions: sideways (x), front and back (y) and up and down (z). The z-axis has the largest amplitude and is the most defining component in generating and inducing muscle contractions. Abercromby at al and Burkhardt stated that vertical movement is the most defining component in generating and inducing muscle contractions. G-POWER uses a true linear vertical motion to provide the most comfortable and natural workout, while increasing the electromyography (EMG) activation of muscles 8-13 percent more effectively than current WBV machines. Get the awesome Multisports G-Power G-10M Linear Motion Platform and enjoy a high tech machine with amazing health benefits. A vibration plate is a fitness training system that can increase your weight loss potential by helping you burn more than 170 calories in just five minutes. The vibration plate also stimulates your muscles, improves the flow of lymph, decreases blood pressure and increases blood circulation and oxygenation. Read on to discover more of the benefits of the vibration plate workout. Call 1-800-875-9145 to speak with one of our fitness advisors with any questions you may have or Go to FitnessZone.com today to order your MultiSports G-Power G-10M Linear Motion Vibration Fitness Platform Machine. 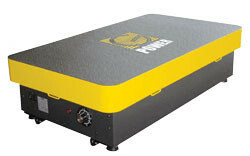 The vibration plate is used during yoga and pilates classes. Training with a vibration plate involves holding a series of standing poses on the plate. The vibrations of the plate cause greatly increased levels of muscle contraction. They also force your muscles to contract repeatedly and alternately for improved muscle strength, balance and coordination. During normal forms of exercise, your muscles contract one or two times per second. Exercising on a vibration plate causes your muscles to contract 30 to 50 times a second. Unlike other forms of exercise which work on only about 40% of your muscle fibers, vibration plate training works on up to 90% of your muscle fibers to help you strengthen muscles and develop more muscle tissue. This leads to increased muscle density and greatly increased strength. You'll enjoy improved balance, coordination and posture, and increased bone density. Vibration plate training will encourage your body to produce increased levels of human growth hormone, which helps in the repair and regeneration of damaged muscles, bones and other tissues. Your body will also produce more serotonin, the hormone responsible for feelings of happiness and well being, and less cortisol, the hormone responsible for feelings of stress and anxiety. The high levels of muscle contractions you'll experience during vibration plate training will stimulate your lymph glands, leading to increased flow of lymph throughout the body and a stronger immune system. Stimulating your muscles will lead to increased blood circulation as well. Your blood pressure will drop, and your blood will carry more oxygen to the cells of your body. As a result, you'll have more energy. Like any other form of exercise, vibration plate training raises your metabolism. As your muscles get stronger, they use fuel more efficiently, and as your blood circulation improves you'll have more energy. These things encourage your body to burn fat and calories from food faster, resulting in an increased metabolism. As your metabolism increases, you'll burn more fat, even when you're not working out. The vibration plate's movements help to strengthen the muscles of your hip flexor and core, to stabilize your entire body and strengthen your spine. The vibrations strengthen the muscles that stabilize your joints to improve flexibility and joint function. Vibration plate training increases blood circulation to all your joints to flush toxins and reduce joint and spinal pain. Order your MultiSports G-Power G-10M Linear Motion Vibration Fitness Machine from FitnessZone.com today!